Redeemer Presbyterian Church, 9333 W. 159th Street, Overland Park, KS. 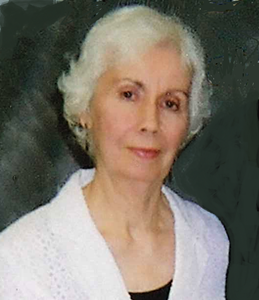 Nancy Dee March, age 83, of Shawnee, Kansas, passed away on November 27th, 2018. Nancy was born in Maynard Arkansas, delivered by her great-grandfather Dr. Clarence Finney, on September 8th, 1935. She was the only daughter of James Claude Foster and Wanda Ruth King. Nancy was likely named for Dr. Finney's mother, Nancy McGuire, but the spelling of her name, actually Nancee, was taken from a posh hat shop in Cape Girardeau - her mother Wanda being very fashionable. In school, her teachers began to write her name as “Nancy” and the spelling gradually changed. Nancy’s middle name Dee is after Wanda's father D.E. "Dee" King. D.E. King and Nancy’s grandmother Verda Finney had "surprised their many friends by secretly driving over Sunday to Burr and getting married" July 6, 1914. Nancy could not pronounce Verda, so she called her grandmother “Honey”. Nancy grew up in Portageville, MO. Her mother taught her appreciation of art, music, and poetry. Wanda and Verda could play the piano and Wanda owned the sheet music of many popular tunes of the day. Nancy took piano lessons from Ms. Vesta Barkovitz. Nancy was active in the family church and choir, First Baptist Church of Portageville, MO, and she was baptized there at age 12. Nancy's grandmother Verda “Honey” Finney King married Ira Capshaw about 1935 and they lived in Chaffey, MO. Ira Capshaw had two sons, Benny and Bob, whom Nancy always considered uncles. As a child, Nancy often took the train to Chaffey by herself to see her grandmother since Ira Capshaw was the train's conductor. Nancy recalled walking with Honey to Buckley's General store in town then Honey giving her a piggy-back ride on the way home. Nancy recalled that Verda kept a sewing form in the attic and it would give her a fright when she went exploring. Verda, a talented seamstress, made many clothes for Nancy, Wanda, and later for Nancy's children. Growing up in Portageville, MO, Nancy's childhood best friend was Peggy Moore, daughter of Portageville Police Chief Joe Moore and wife Helen Moore. Nancy, once she "could make change properly", sold candy, soda pop, and hand dipped ice cream at her father's grocery, Foster's Quality Market. “A few cents could get you an RC Cola and a moon pie". There were two movie theaters in Portageville and Nancy frequented the Shannon Theater where her favorite movies were the scary types. Her least favorite genre was the ‘singing cowboy’. Fifteen cents bought a double feature, complete with cartoons, shorts, and news plus a bag of popcorn. Along with summer afternoons at the pictures, Nancy loved to read "the classics and all the Nancy Drew stories”. Nancy, throughout her life, was an avid reader. Nancy was a majorette in her high school band. During her senior year at Portageville High, the chamber of commerce selected her to represent Portageville in the American Legion Fair. She was crowned Miss American Legion of 1952 and got the use of a white convertible Cadillac for one week in addition to having her photo in a calendar. Nancy graduated from Central Methodist, Fayette, MO and while there was set up by friends on a date with William (Bill) Paul March. Nancy recalled Bill had dashing grey flecks at his temples, being a bit older (having taken two years off school due to being drafted to the army during the Korean War). In college Bill sported a black trench coat and was a bit of a prankster with his best friend Charles "Charlie" Miller who dubbed themselves “the ATOM Club”. Nancy recalled they had an air of military, seemed "older and more sophisticated" and were the "coolest." Unlike most college boys, Bill and Charlie could take their dates to the VFW. Nancy recalled that she wrote her mother a letter after a few dates with Bill, telling Wanda that Bill had "the most startling blue eyes". Wanda later told Nancy that when she read about Bill's blue eyes, she knew her daughter was falling in love. Nancy and Bill March married August the 18th,1957 in Portageville, MO at First Baptist Church. They honeymooned at Poplar Bluff, MO in a cabin "where Current and Jack Fork rivers meet", then went on to St. Louis, where they had their first house in Maplewood, MO. Bill worked for the phone company; Nancy worked as an elementary school teacher. Their first pet was a Basset Hound named Missy. They had a Triumph in which they cruised around the country taking in the sights. Bill took Nancy horse backing near Steam Boat Springs, Colorado on one such trip; Nancy rode a horse named Tornado, which she didn't enjoy as much as Bill, due to being thrown from a mule as a child at the Foster farm. Their daughter Amy was a pregnancy which produced the most unusual craving for shrimp, which normally Nancy could not abide. Their son Matthew (Matt) arrived eighteen months later. The March family moved to St. Joseph, MO, Bill having been transferred there. Nancy was very active in her children's school, and in her church both teaching Sunday School and singing in the choir. In 1985, Bill and Nancy moved to Shawnee, Kansas. Nancy has three grandchildren born to her son Matt and Sarah Nilson March: Jessica, Natalie, and Will. Nancy was a devoted Christian, known for her love of her faith, her family, and her genuine empathy for others. Visitation at noon, with 1:00 p.m. funeral service, December 3, 2018 at Redeemer Presbyterian Church, 9333 W. 159th Street, Overland Park, Kansas. Burial in Pleasant Valley Cemetery, Stanley, KS. Add your memories to the guest book of Nancy March. My favorite memory of Nancy is when her daughter, Amy, was getting married and (we) went bridesmaid's dress shopping. Nancy was ever the doting mother, and to our huge surprise (and relief) bought our bridesmaids dresses for us! Typical generosity from such a lovely woman! We love you and hope you rest in peace now. Please keep a watchful eye over Bill, Matt, Amy and the extended family. I love you, Mom. I will miss you more than I can say.